We are a group of experienced health care professionals dedicated to providing scientifically validated treatments to alleviate physical and psychological problems. We currently provide Physiotherapy, Women’s & Men’s Health Physiotherapy, Adult Clinical Psychology, Psychotherapy, Couples therapy & Psychosexual therapy. This means that our patients get better quicker with fewer visits, less expense and fewer relapses. Contact us for physiotherapy, women’s health physiotherapy men’s health physiotherapy, adult clinical psychology, psychotherapy, couples therapy & psychosexual therapy in Galway and surrounding areas. 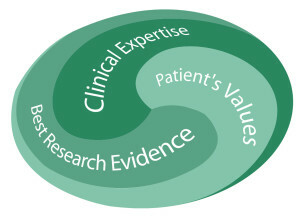 Evidence-based therapy involves three concepts. The first involves using the best available research to inform clinical practice. The second is listening to the patient to understand what is important to that individual. The third involves using the expertise of the clinician gained through undergraduate and postgraduate training. Our approach embodies all of these concepts to get the best possible outcomes for our patients. It takes a lot of dedication, effort and expense to stay up-to-date with all of the latest research. At the Evidenced-Based Therapy Centre we are committed to this challenge as ultimately it brings the most efficient and effective treatment for our patients. When you go to see any healthcare professional it is important to be empowered with as much knowledge as possible about your condition and the treatment options. If you think we can help, we would love to hear from you. Get in touch for more information about physiotherapy treatment, women’s health physiotherapy, adult clinical psychology and child and adolescent clinical psychology in Galway and the surrounding areas. Read some examples of how adult clinical psychology physiotherapy and women’s health physiotherapy have helped other clients. Penetration: why is it hard to get hard?